Your guests will be impressed by the new Tapas Set. The handmade beechwood board can be used on both sides. One side with the indentations belongs to the mouth-blown glass dishes, which are intended for fine antipasti and other delicacies. The other side is used as a meat or cheese platter. 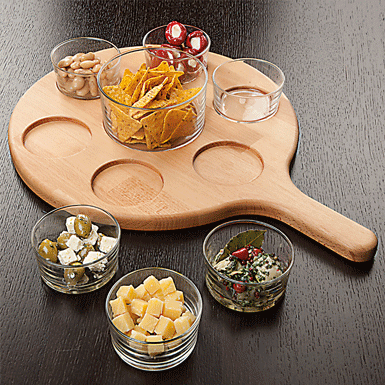 Set your imagination free and enjoy the new Tapas-Set.